I got lucky on a bid this/Saturday morning. (This seems to be good time for me.) My win was one of the CIRCUS SERIES (listed above), of which we have only one other The BIG TOP ELEPHANT/DUMBO. This is an old, old series and usually out of The Cornwall Museum's budget. I bid three hours before the close and no one bid after me. The seller did not label the piece 'vintage', which it is, so I got it for less than half what they usually go for. I will reveal the character at a future date when it is officially donated to the Collection. Since Jason and Stef's birthday's are so close the contribution to the PEZ Museum is made jointly of this new SPECIAL EDITION CRYSTAL BUBBLEMAN set. Happy BirthdayS to you. As totally unromantic as it seems - Mom got a SPECIAL ANNIVERSARY, SILVER EDITION of that famous him & her couple MICKEY & MINNIE. These are only available from rare sources via Europe and will now have a special place in the Cornwall Collection. 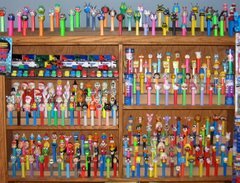 Note: The PEZ "Anniversary" is of the birth of the 1st PEZ in 1927. Coming out in the fall, about October, 2007. You got it Dallin - you know your Disney Princesses. I won 4 PEZ at 6 a.m. this morning (ebay - I was the only bidder, YEA!). This completes a set. I will reveal the new PEZ identity's in the coming days/weeks. Two more Disney Princesses/Lead Characters are coming out in the fall. Any guesses who? Recent acquisitions required some reorganizing of some of the displays. Mickey & Friends were joined by other sets to make an all Disney shelf. Looney Toons were moved to a shelf of all classic cartoon characters. A children's cartoon character shelf was formed. Room was made for the Bride and Groom Pez Pals. Easter got it's own shelf - no longer combined with Christmas and Halloween.